Join us as we raise funds for a worthy cause! 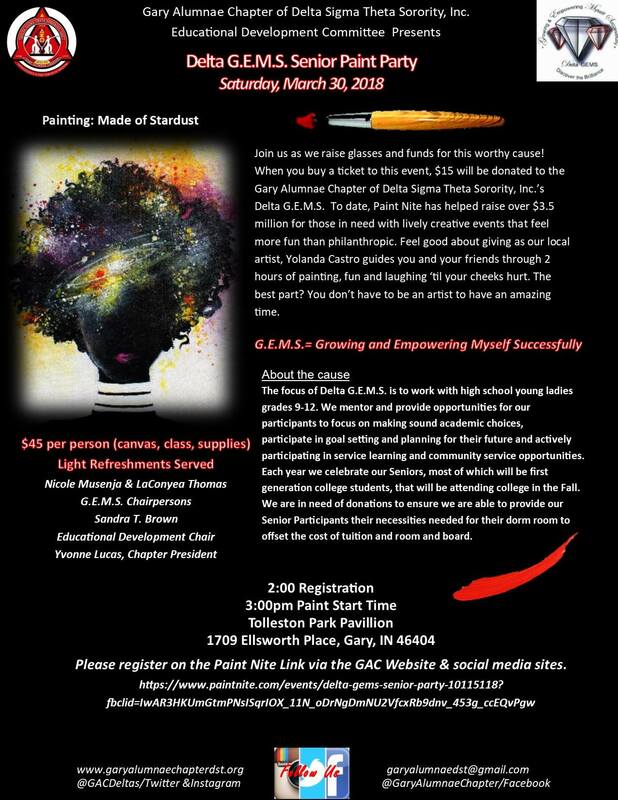 When you buy a $45 ticket to this event, $15 will be donated to the GAC Delta GEMS for high school senior girls to have much needed items for college. To date, Paint Nite has helped raise over $3.5 million for those in need with lively creative events that feel more fun than philanthropic. Feel good about giving as our local artist guides you and your friends through two hours of painting, networking and laughing ‘til your cheeks hurt. The best part? You don’t have to be an artist to have an amazing time. Come out for an amazing good time while helping out amazing students. Seating is limited so move FAST! $45 will hold your seat & lock you in for the fun! *This event is open to the public and all participants should be at least 21 years of age to enter.